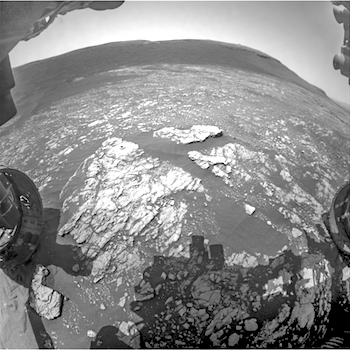 Sol 2382, April 19, 2019, update by MSL scientist Susanne Schwenzer: Some days just give me goose bumps. 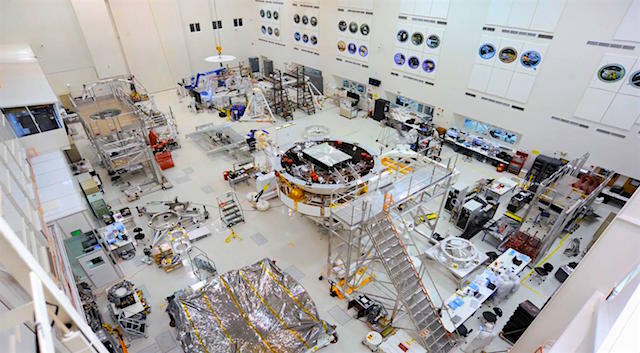 First, looking at yesterday’s plan I realized that we did something really unusual overnight: Wrap up the drill activity on one site and start the drill activities on the next in the same sol. As reported yesterday, we said Good-bye to “Aberlady,” and we turned the rover to “Kilmarie,” our next drill target. The two targets are just 80 centimetres away from each other. • Small debris‐covered stagnant ice deposits (termed valley fill deposits or VFD) are located inside a valleys system in Terra Cimmeria, Mars. • Morphological properties (convex‐upward morphology, crevasses, and sublimation pits) suggest a current degradational stage of VFD evolution. • The location of VFD within the ejecta blanket of Middle Amazonian Tarq crater points to impact into shallow ice as likely formation process. 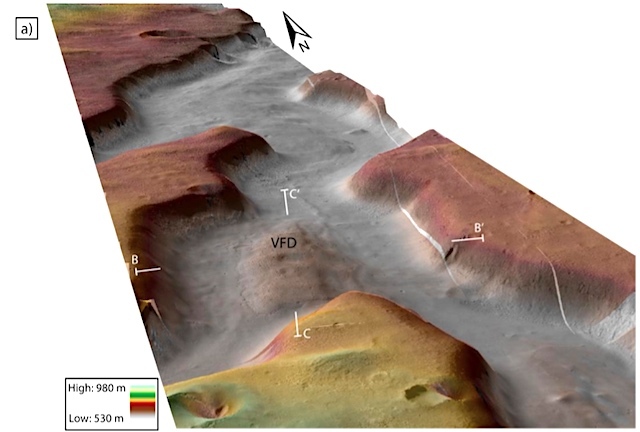 In the last two decades with the increase of high resolution imagery data, more studies report the presence of ice deposits covered by dust and debris on the Martian surface, in both mid‐latitudes. 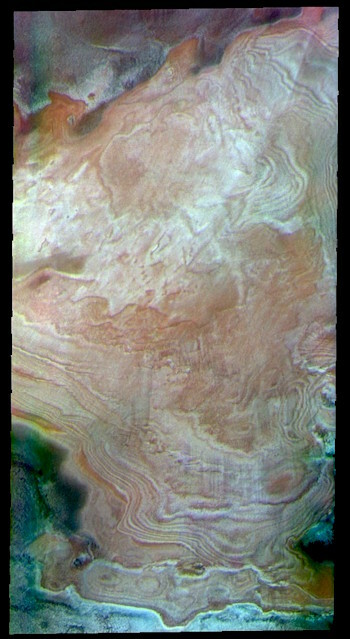 These deposits must have been formed under different atmospheric conditions, since water ice is not stable in the current surface environment. One of the generally accepted hypotheses for their formation is precipitation induced by variations of Mars’ axial tilt known as obliquity. During high obliquity phases, ice would have sublimated from the poles and re‐deposited in the mid‐latitudes. Here, we report the presence of small‐scale ice deposits, located on the floor of a valley system in Terra Cimmeria. Although it is clear that these deposits were formed in different climatic conditions, their formation seems to be related to an impact into a shallow subsurface ice layer, redistributing a mixture of ejected material and ice across the region around the impact site. HiRISE has often imaged inside Kaiser Crater to monitor active sand dunes and gullies. Surrounding these dunes, we often find clean bedrock exposures, because the actively moving sand clears off the dust. Kaiser Crater is 207 kilometers wide and was named after Frederik Kaiser, a Dutch astronomer (1808—1872). • Landscape evolution modeling indicates Endeavour experienced an early period of fluvial erosion in a semi‐arid environment. • Since the deposition of the Grasberg and Burns formation rocks, wind erosion has excavated interior deposits and eroded the crater rim. • Up to ~400 meters of Burns formation rocks have been excavated from the interior of Endeavour crater. The Opportunity Rover explored the rim of the Noachian age Endeavour crater from 2010 until 2018. Only small segments of its rim are exposed above a regional sulfate‐bearing sandstone unit called the Burns formation. By studying the morphology of these rim segments with orbital data sets and observations from Opportunity, the history of the degradation of the crater was identified. The nearby Bopolu crater is similar in size to Endeavour, but is younger and fresher. Simulating the erosion of Bopolu to create a crater rim that looks similar to Endeavour’s current rim shows that Endeavour experienced a late Noachian period of fluvial erosion in an arid environment. THEMIS Image of the Day, April 19, 2019. Today’s false-color image shows part of Bonestell Crater. 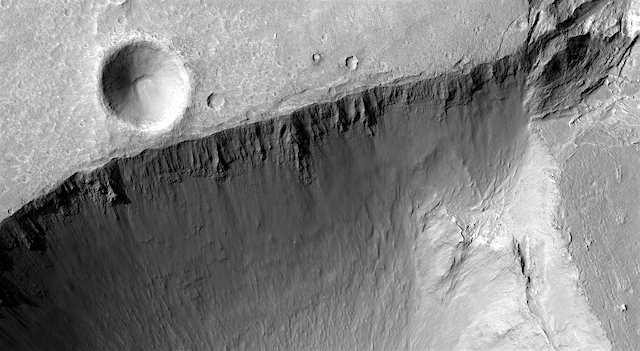 This is a relatively young crater located in Acidalia Planitia. Dust blown into the crater and the downslope movement of fine materials from the rim are slowly modifying the crater features. 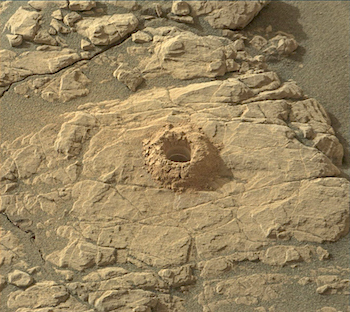 This material is responsible for the sand dunes visible at the bottom of the image. Dark blue tones in this false color combination typically indicate basaltic materials. Pits and depressions to the east of Juventae Chasma. Juventae Chasma is a large box canyon, located north of Valles Marineris in the Coprates quadrangle and cuts more than 5 kilometers into the plains of Lunae Planum.